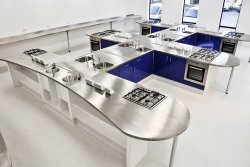 Our custom made stainless steel worktops are ideal for a wide range of installations; from laboratory bench tops to countertops for restaurant kitchens and bars, school food technology work surfaces, washroom vanity tops and high-end stainless steel kitchen worktops for domestic homes, we are expert at delivering top-quality products to meet both client expectations and timings. From a hygiene perspective, stainless steel worktops are unbeatable - our high-quality, 304 food-grade steel has natural inherent antibacterial properties, making it the obvious choice for healthcare environments or catering. It is also resistant to the heat of pans placed straight from the hob or oven. 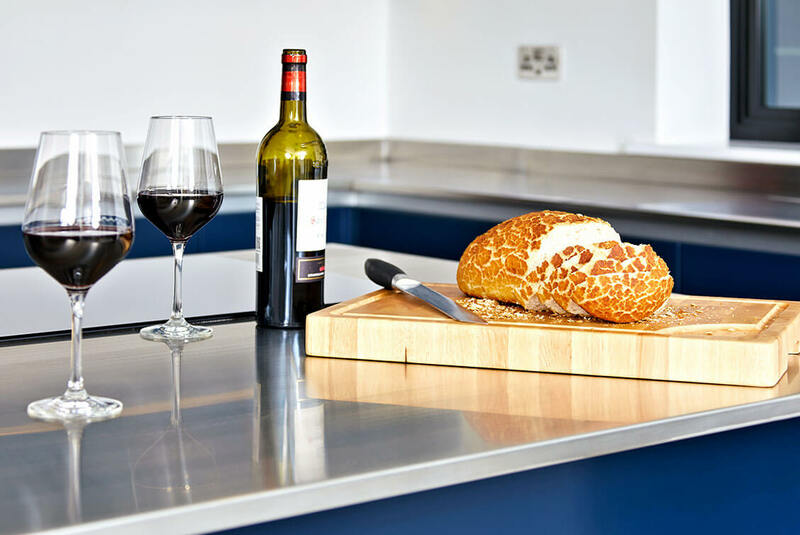 Our 316-grade metal worktops are designed for laboratories, where they offer an exceptional level of resistance to acid and heat. 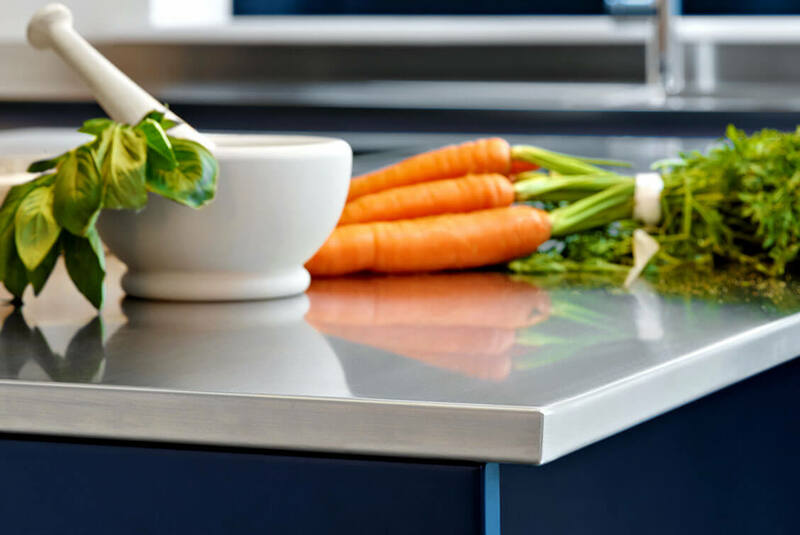 The options we offer on our stainless steel worktops are almost limitless; choose from a wide variety of lengths and widths, curved edges and radius corners, and integral bowls and cut-out for kitchen appliances can also be seamlessly integrated. 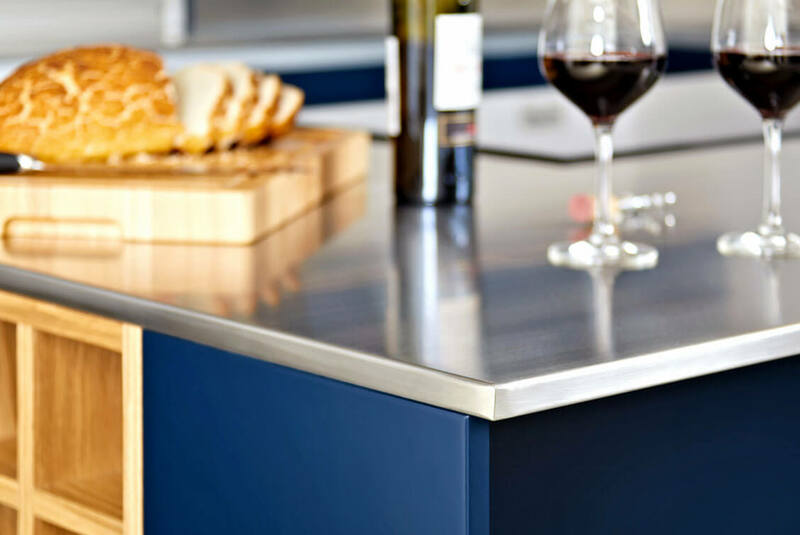 We supply all our stainless steel work surfaces with a moisture-resistant MDF sub-frame, for incredible rigidity and ease of fitting. 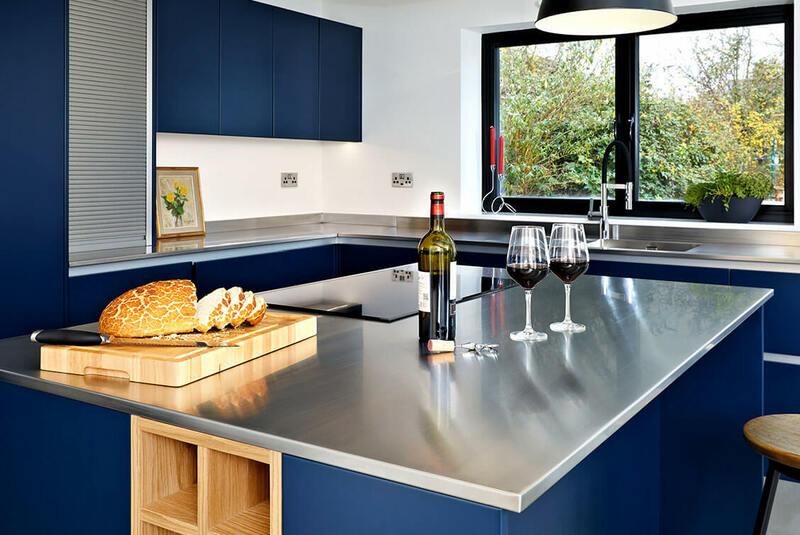 Our steel worktops are the most environmentally-friendly option, featuring 60% recycled material, and being fully recyclable at the end of its life span. This strength and durability mean they will last for decades – we provide a twenty-five-year guarantee on all our bespoke stainless worktops*. *Please refer to Help and FAQ page for full warranty terms and conditions. 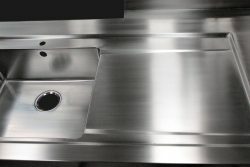 Our 316-grade stainless steel laboratory worktops provide supreme resistance to acid and heat, making them the perfect surface for a laboratory or clean-room environment. Their level of durability ensures they will last for decades – longer than all other materials, including Trespa and resin, with no danger of dust build-up from wear/residue over time. This makes our laboratory bench tops the obvious choice where chemical resistance, durability and long-life guarantee are of critical importance. At DSM, we have more than fifty years’ experience in fabricating steel products to our customers’ specifications. 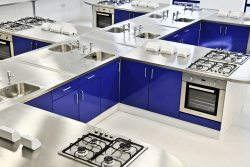 Whether you are sourcing a single worktop for a school laboratory, or need to outfit an entire lab – or series of labs – for a university or industrial space, we can supply the products to meet your needs. Our ability to deliver fully bespoke solutions allows us to create every product exactly to our client’s specifications. Whatever problems you encounter in space or highly-specified usage, we can assist you in developing a solution. Whether the room is an awkward shape, the base units especially low or high, or the space is unusually tight, we will fabricate a metal laboratory worktop to fit. We supply our work surfaces with a bonded subframe of 18mm moisture-resistant MDF for added strength and rigidity, and for ease of fitting (25mm and other thicknesses are also available) to allow simple screw-fixing installation to base units below. Alternatively, we can supply our lab worktops completely wood free, with stainless steel stiffeners beneath, making them suitable for clean-room installations. For areas where a 90-degree corner might present a hazard, we can round the ends, or supply with water retaining edging where liquid spills need to be contained. Whatever your needs, we can create the product to suit the specific installation. 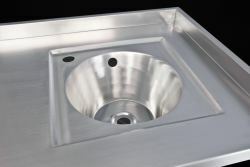 We can also incorporate any shape or size of basin – with any configuration of bowls and drainers – into any section of the work surface, either flush to the work surface or contained within a recessed anti-spill area. 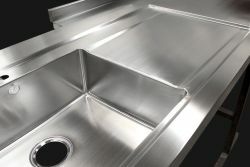 Check out our Sink section for the almost limitless possibilities. 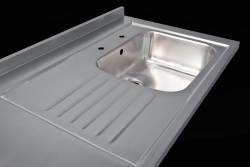 From sit-on sinks to inset basins, with or without drainers, we can accommodate your requirements. All basins are welded flush into the surface, leaving no “dirt traps” in which bacteria can gather. We pride ourselves on not just our adaptability and attention to detail, but also on delivering a quality product, like our stainless steel worktops on time – so that you can book your fitters, knowing your products will be delivered when you need them. Our expertise doesn’t stop at worktops – check out our cupboards, tables, splashbacks, trolleys, fume cupboard liners and frames, all of which can be fully customised. When it comes to nurseries, schools, colleges and universities, we understand the need to balance durability, hygiene, maintenance and safety against economy. Our stainless steel is of a premium quality – which, thanks to its strength and supreme durability, outweighs all other options for value for money. Virtually maintenance-free and with inbuilt antibacterial properties, our superior-quality 304 food-grade steel (316-grade for laboratories) will last for decades, retaining its stain-free surface and gleaming appearance. 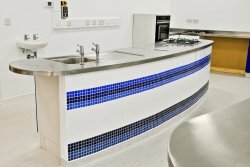 We can fabricate work surfaces for use in any environment, from a nursery playroom to a school kitchen, a food technology room or a laboratory. Thanks to our unique factory set-up, each item is bespoke – meaning you can rest assured that your requirements will be met exactly. We combine this attention to detail with a strict policy of meeting deadlines: we will always deliver to the agreed time. 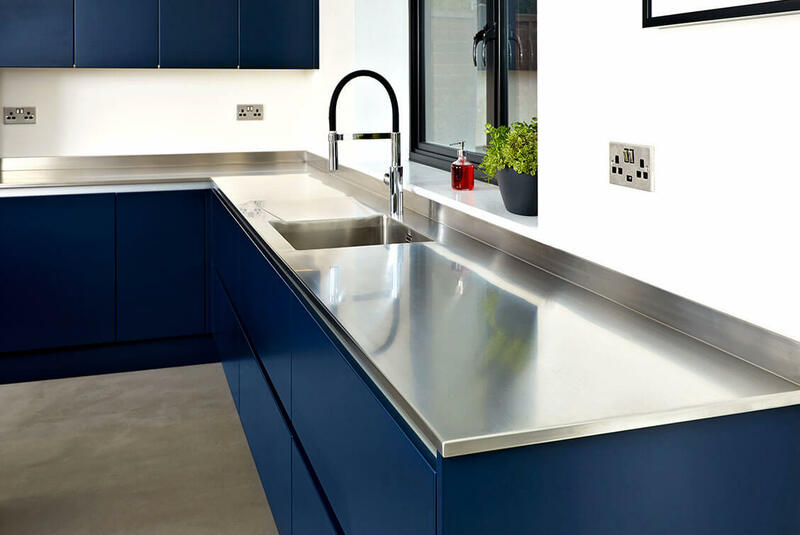 Our work surfaces are also the environmental choice: the raw steel sheet comprises 60% recycled materials, and the end product is fully recyclable. Whether you require rounded corners for safety in a nursery; a built-in sink for the washing of hands or equipment; or a sink without an overflow, to meet health standards in a laboratory, DSM can supply to your needs. Check out our range of tables, frames, cupboards, sinks and splashbacks, all of which are as durable and adaptable as our worktops. Our ‘304’ food-grade stainless steel is the safe, hygienic choice for any healthcare environment. With its proven, inbuilt antibacterial qualities and easy-clean, non-porous surface, it is the perfect material for any clinic, hospital or care home, where cleanliness is paramount. 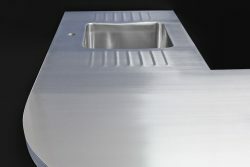 Our inset basins are carefully welded into place, leaving no cracks in which germs can breed. Highly resistant to both heat and impact, our steel is also the most durable material available – making it a more cost-effective option than any other, including Trespa.DSM has a wealth of experience in fabricating bespoke steel work surfaces across the Healthcare Sector, from hospitals and GPs’ practices to dental surgeries and care homes. Our skilled engineers will create worktops to the exact size and specifications you require. As well as basins (with or without drainers), we can fabricate frames, shelving and cupboards to integrate with the work surfaces. The counters themselves can be supplied with a strengthening, moisture-resistant MDF subframe, for simple screwing to the base units below. For areas such as a consultation room, where a sharp corner might present a hazard, we can create a rounded end – or even an entire, curved edge, which might be a good solution if you are outfitting a tight space. For rooms where cleaning products or medication are stored, we can supply lockable cupboards to fit beneath the countertops. It is this flexible approach, combined with the high quality of our products, and our commitment to delivering to schedule, that makes us a market leader. We are committed to meeting our deadlines so that you, in turn, can meet yours. Please take a look at the almost limitless options available for our bespoke worktops – and check out the rest of our product range, for integrated and sit-on sinks (with or without drainers), plus splashbacks, cupboards, trolleys, plinths and more. Get in touch today to discuss your project’s requirements. Like a fine chef, we at DSM have boiled down the sum total of more than fifty years’ experience to a concentration of skill, quality and fine craftsmanship – making us the perfect choice to fabricate the bespoke countertops for your commercial kitchen. Our top-quality, 304 food-grade steel boasts such supreme strength and durability that it can withstand the daily impact of a catering environment for many decades, making it incredible value for money. It is also low-maintenance and naturally antibacterial, with high levels of heat resistance: hot pans from the oven or hob can be placed directly on to the surface, with no damage or discolouration, even over many years. 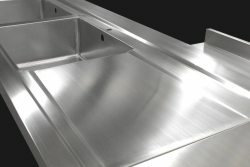 Thanks to our unique factory set-up, we can fabricate metal worktops to any specification, with a choice of squared-off or rounded ends (the latter being ideal where corners might present a workspace hazard), and with a straight or curved edge. 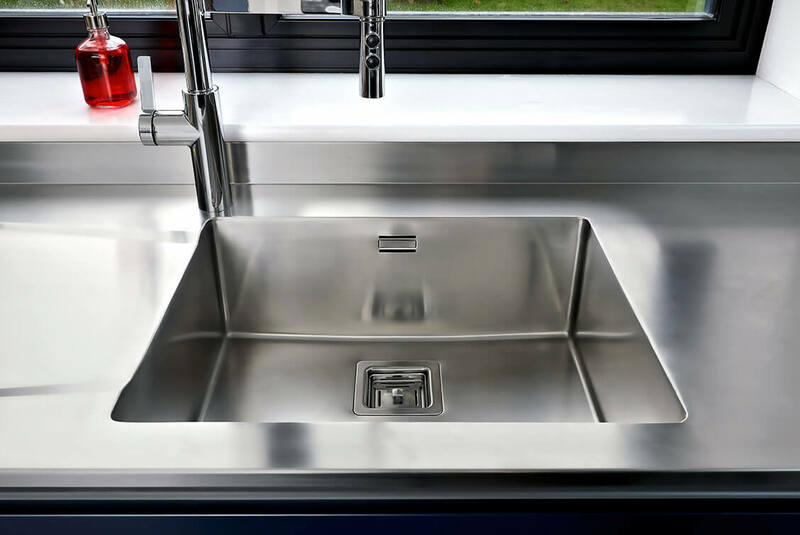 We can weld a wide variety of sink bowls and drainers directly into the work surface, to create a seam-free finish – ideal for maintaining a germ-free kitchen. Our work surfaces will outlast everything else in your new commercial kitchen – unless you opt for an entire stainless-steel kitchen. Because our service is fully bespoke, you can choose any combination of open shelving, doors and drawers, to meet your specifications. Visit our sinks, cupboards, frames, tables and splashbacks sections for more ideas. We are committed to delivering a quality product to time – we will always meet our mutually-agreed deadlines so that you can meet yours. Contact us today to discuss your requirements. 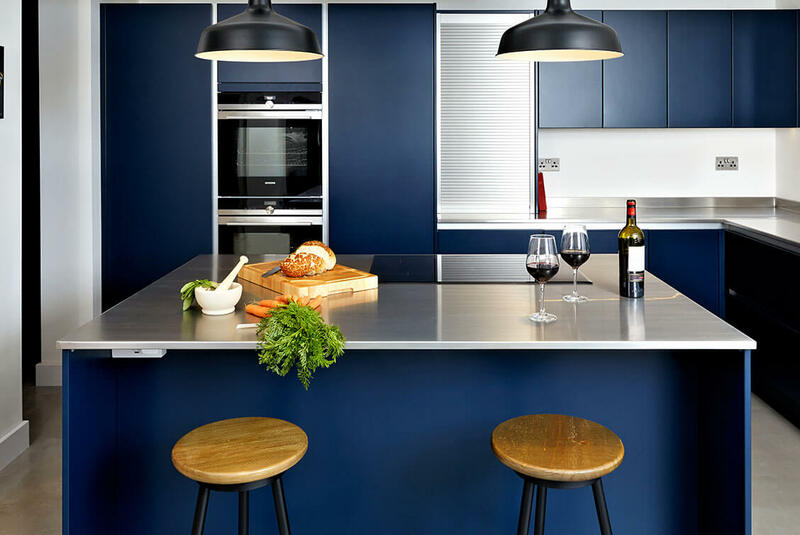 Whether you are looking for an airy, reflective surface for a loft-style apartment or a sleek, chic focal point for a contemporary home, a polished stainless steel kitchen worktop is the perfect choice to tie your room scheme together. The gleaming counter will complement any modern kitchen or bathroom and will retain its sheen for years to come, lending a covetable, high-end finish to your home. The superiority of our kitchen worktops is attributable to our in-house production base, where our engineers use only top-quality, food-grade steel. Their skill and experience mean they can craft a worktop to any design, to fit any space. What’s more, they can customise it in almost limitless ways, ranging from curved corners to an entire curved work surface, and from inset basins to built-under shelving or even lockable cupboards. We are so confident in the quality of our steel and craftsmanship, that all of our products come with a full 25-year guarantee, covering workmanship and materials* – so your stainless steel kitchen worktop will outlast everything else in your kitchen. Because every one of our stainless steel kitchen worktops is bespoke, you can be sure of possessing a one-of-a-kind kitchen. 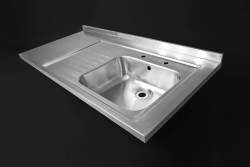 We have a huge range of sinks that can be welded flush into the counter, leaving a seamless finish, and we can also create splashbacks for your sink and cooker, or for your entire work surface. The options don’t end there: we can fabricate any number of shelves, cupboards, drawers, tables and trolleys. There's an almost limitless array of combinations. 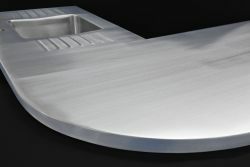 We also fabricate shower trays – a superb option for a streamlined bathroom. Whatever your vision, we can help turn your dream into a reality. Get in touch today, and we will help you create the living space that you have always wanted. *Please refer to the Resource section of our Help and FAQ page for full warranty terms and conditions. At DSM, we have many years’ experience of working with the healthcare sector, including veterinary clinics. We understand that it is vital to have a surgery that’s functional, safe and hygienic. Thanks to inbuilt antibacterial properties, our high-quality, food-grade stainless steel is the most hygienic surface available. It is also the most durable, lasting for decades – making it a highly cost-effective material. It will last longer than Trespa or resin, both commonly used in healthcare environments. Its supreme impact-resistance is perfect for veterinary practices, where it will stand up to the activities of even the most energetic of patients. 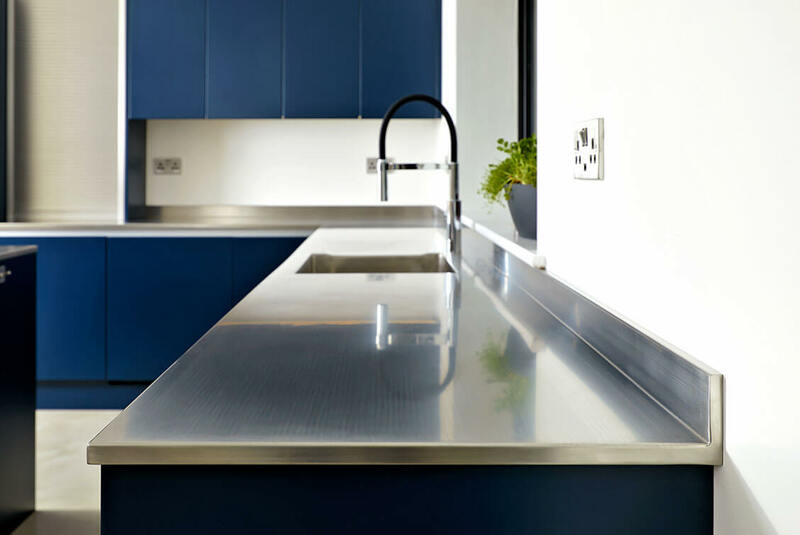 Every DSM product is bespoke: all of our stainless steel countertops can be customised to fit the exact space you require making sure it's to your specifications. Whether you need to furnish an awkward space or to ensure there are no hazardous corners on which your animal or human visitors might harm themselves, our engineers can fabricate the product to suit. Whatever your requirements, we can accommodate them. Of course, we are aware that veterinary surgeries have a huge range of needs, depending on the size and nature of their patients. Whatever your individual requirements, drop us a line, and we will do our utmost to help. We offer a wide range of other products. Lockable cupboards and drawers, to keep medication and surgical implements away from children (and dextrous pets). Shelving for reference books and supplies. Splashbacks to protect the walls behind sinks and stainless steel worktops. A staircase up to the worktop or examination table for larger dogs, to save the veterinarian’s back. Examination tables – with or without castors. A large plinth beneath basins or metal countertops, to prevent animals from running underneath.